There is little known about the early masons, however, an examination of the late sixteenth and early seventeenth century monuments suggests some may have been produced by the same workshop based in Norwich e.g monuments to Jaques de Hem and Martin van Kumbeck. There is further suggestion that over the latter century a school of monumental sculptors developed in Norwich itself. In the eighteenth century "The Norwich School" emerged. A skilled group of craftsmen who produced high quality work which they signed. They tended to follow national trends with Pevsner believing that two of them i.e Robert Singleton and Robert Page "were every bit as accomplished as the London masters" The major members of the school were : Robert Page, Thomas Rawlins, John Ivory and Robert Singleton. Was a members of the "Norwich School" of monumental masons. 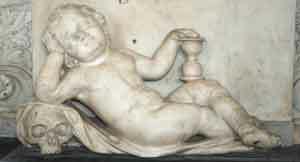 described by many as the best of the Norwich statutaries his works are distinguished by the use he makes of coloured marbles (which are often used as veneers), charming cherubs and elegant sarcophagi. Page learned his trade as an apprentice to Robert Singleton. In 1737 he bought the stock in trade of Singleton and Bottomley. After gaining his freemanship he acquired premises at the back of the Inns and not only advertised himself as a freestone mason, wood-carrver and monumental mason but also anounced in the Norwich Gazette that his works was "as cheap and as well as by any other stone cutter on this side of London." His first known work monument to John Moore (died 1725) in the Cathedral, is architectural and he incorporate his trademarkof using a variety of marbles to great effect. The cluster of three cherubs, which are carved on the apron of this monument can also be seen on the monuments to Edward Coleburne (1693 - 1730) in Saint Peter Mancroft and Dr Thomas Crowe (1672 - 1751) in Saint Andrews. Noel Spencer believes the latter (on left above) "cherub heads are the most delightful I have ever seen". Just as Page benefitted from his apprentiseship to Robert Singleton, Page passed his expertise on John Ivory, nephew of the Norwich architect Thomas Ivory. Rawlins, work has been variously described as being "only second in quality to those of Robert Page" by Noel Spencer, "perhaps the most accomplished of the Norwich school" by Finch and "a sculptor who ranks high " by Pevsner. He was both an architect and a sculptor exhibiting architectural designs at the Society of Artists and Royal Academy in the Late 1770s. The son of a Worsted weaver, Rawlins claims to have been trained by " the most eminent carvers in London" prior to establishing his business on a site next to the Duke's Palace Yard. Some of his monuments bear similarities to Sir Henry Cheere - leading some to the assumption that Rawlins may have worked with this craftsman. Like Page he was an expert in coloured marbles. Since most of his monuments were produced after 1750 his style is described by Pvesner as ranging from "mournful Rococo to Neoclassical". The change been illustrated by two monuments in Saint Andrew: the first to John Custance (1673 - 1752) the second to Richard Dennison (d1767). Later monuments to Robert Rushbrook (1705 - 81 ) in Saint John Maddermarket and William Wilcocks (1714 - 1770) in Saint Swithin show an even greater awareness of neo classical motifs, whilst the memorial to Thomas Churchman (1702 - 1781) is a particularly good piece of work being fully neoclassical, complete with a portrait in an oval medallion. "Francis Stafford at his house in the Cathedral Cloysters, continues to sell monuments and gravestones of all sorts viz. Mural Monuments, Altar Tombs, Black Marble gravestones with Coats of Arms well carved, with their proper embellishments or with inscriptions only: Portland Headstones and Feet Stones etc...specimens may be seen in the Cathedral church snd many other places." Later his business was carried on in Tombland. These photos are not at the moment mine. The written text is borrowed from another site, acknowledgements are given. These are just added to halt a curiousity in knowing who made such fantastic items. Robert Singleton was the first sculptor reputed to come from the "Norwich School". Originally from Bury St Edmunds he had a successful practice in Norwich adjacent to the Cathedral. Some of his work was completed in partnership with George Bottomley. His work includes : the cartouche to Richard Manby (1671 - 1720) in Saint Martin at Palace which is redolent with imagery including a winged death head , putti and drapery hung from scroll;. the monument to Mary Bateman (1706 - 21) in Saint Gregory which is more of an architectural piece; and my favourite which is a delightful memorial to Thomas Pindar in Saint George Colegate which is a standing wall monument in white marble, depicting a cherub reclining cross legged, his right elbow resting upon a skull whilst his left hand holds an hour glass(pictured beside). Singleton sold the stock in trade owned jointly with Bottomley in 1737 to Robert Page, who had been his apprentice.Although he died very young he passed his skills on to a pupil who has been described as "the best of the Norwich statuaries" - whose carvings of cherub's are as delightful as his master. Advertised as "Stone and Marble mason"
John was the nephew of local architect Thomas Ivory and the cousin of William Ivory.The three worked together at Blickling in the 1760s and 1770s. Although by reason of his apprenticeship to Robert Page he concentrated on sculpture. Initially he took over Page's shop and yard near the Popinjay on Tombland, however, in 1767 he moved to Upper Connisford Street, which was nearer the river which made delivery of stone and marble easier. in 1774 he relinquished the masonry side of the business to enable him to concentrate on marble work. in 1776 he went into partnership with John De Carle who was primarily a builder noted for erecting houses designed by John Soane. In 1792 he moved his premises to King Street. He continued working until his early 60's. Although his son Thomas continued his father's work,he predeceased his father after which the stock in trade was auctioned. Although his work "was not the equal of Page or Rawlins" (Pevsner) he produced some very attractive memorials.The majority had a "trademark" style consisting of : a central inscription panel flanked by geometric or scrolled wing brackets, with a pyramid and urn above the simple cornice. He tends to use cherubs to decorate the aprons and often uses a "signature" decorative element consisting of a small rosette with a central curving stem or stamen. This style is illustrated on memorials to William Clarke (1687 - 1752) in Saint George Tombland, and to Martha Wilson (1704 - 1789) in Saint Michael Coslany. The signed memorial (on right above) to Charles Mackerell (1676 - 1727) in Saint Stephen is of slightly different design, being an architectural marble tablet with a central rectangular inscription panel framed by a heavily ornamented scrolled and lugged architrave. 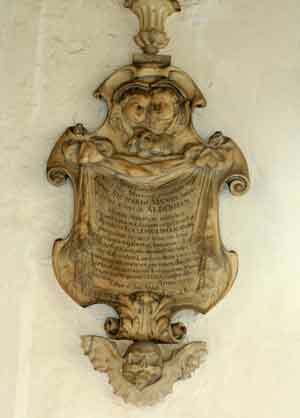 Although not signed it is surmised that the monument to Joseph Chamberlain (1712 - 62) in Saint Gregory may also be attributed to Ivory because of its similarities to the Mackerell piece.